Summer Camp is designed in ECO style. The leisure activities include learning foreign languages, sports, entertainment, games, quests and quizzes. Furthermore, it's the right daily routine, security, guardianship of the attendants, daily conversations, myths of Ancient Greece and excursions. And, of course, cultural activities, dancing, enjoy the sea, the sun and make a lot of new frie nds! The Summer Camp means p ermanent communication with educators only in English and daily lessons of English and Greek. The language modules have been provided by professional teachers and developed for children with language proﬁciency of levels A1-A2, B1-B2 in accordance with the international standards of the Association of Language Experts in Europe (ALTE) and approved by the CLUB FOR UNESCO OF PIRAEUS & ISLANDS. 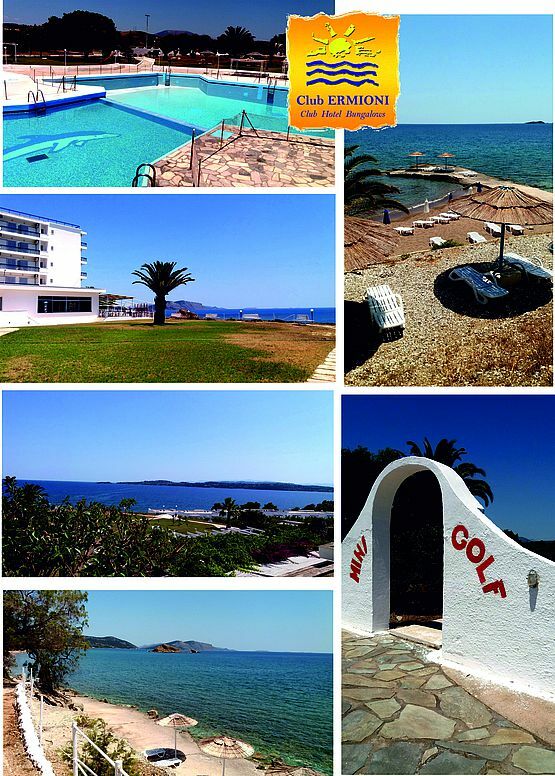 Accommodation at the "Club Ermiony Hotel" the biggest tree star hotel resort of Peloponese that is located on a private peninsula of 230.000sq.m only 6 km distance from the town of Ermioni, Argolis Prefecture, 190 km away from Athens and 55 nautical miles from the port of Piraeus. The great Cape running far out into the Sea practically separates the Argolida Bay from the high sea, forming an extremely beautiful harbor, on the shores of which the small town of Porto Heliis located. The hotel is in a beautiful olive and orange trees park with four own private sandy beaches and its gentle walk to the sea. - excursions to UNESCO World Heritage sites. - 24-hour security, medical service. The area of the hotel is fenced and guarded. Entrance of outsiders, without a special pass, is FORBIDDEN. Children are under 24-hour supervision of educators, trainers and attendants. Spetses is a small but very picturesque island with a multitude of eucalyptus and pine forests, mosaic streets and magnificent beaches. Earlier known as Pityousa, meaning “pine-clad”, Spetses also boasts of a lot of herbs and plants, of which spices are made. The island has its ancient sea traditions. Here you will not see any transport, except for bicycles and mopeds, it is forbidden here. It makes the island ecologically clean and attracts tourists. The symbol of the island is the image of heroine Lascarina Bubulina, a rich widow, who after the death of her husband during the war of 1821 for independence assumed command of the ship and fought against the Turks, with which she gained reputation and love among the citizens of Spetses. On the Dapia Quay, there is a monument to this brave woman. There is also a house-museum, dedicated to her that we will visit. No less interesting is the museum located in the mansion of Hadji Janis Meksi. Here, there is a collection of historical artifacts and some of them date back more than 400 years. with exceptional acoustics. Until now, plays by ancient Greek playwrights are performed on this stage. was founded by Nauplius, the son of Poseidon and Amymone, who called it “Nauplia”. Admission to all museums and areas of all historical monuments of Greek culture is free of charge and organized by the CLUB FOR UNESCO OF PIRAEUS & ISLANDS.Our guides introduce children to the history of Ancient Greece, myths and monuments of architecture.The price of the excursions is included in the price of the tour. There is also an opportunity to choose other different excursions for an additional payment. Greece is a country of the European Union and an entry into and stay in which is allowed only afterhaving being granted a visa or with a biometric passport. Medical and sports insurance is requiredfor the whole period of the child's stay abroad.The accompanying person is obliged: to supervise the safety of children during the tour, to be responsible for the preservation of all documents from the moment of departure of the children abroad and till the time of return to Ukraine. All children must have valid passports. 6. Guarantee of both parents (the parents take on all expenses during the child's stay abroad) - this phrase must be in the guarantee; the original and the copy must be certified by a notary public. 7. Confirmation by one of the parents about their income, or a certificate from the workplace, or a bank account. Director for International Relations of the Club for UNESCO of Piraeus and Islands and Head of Youth Apollon and Poseidon Cultural Exchange Programs in Ukraine. On the first day of the arrival at the camp, educators conduct instruction to children on all major issues.But the main request to you, parents, is to hold a conversation with your child about importance toobserve the rules of stay in the camp, despite the protection, on the prohibition to leave orarbitrarily stay away from group, and the prohibition to travel independently in a country, the language of which the children do not understand. Although Greece is an extremely friendly country, one should remember the elementary safety rules. Recommend your child to be friendly and sociable in order to make as many friends as possible. Όμιλος UNESCO Πειραιώς & Νήσων"Building peace in the minds of people"